Ticks are a growing concern and for good reason. With the increasing population of deer in Pittsburgh as well as reports of Lyme disease diagnosis doubling over the past 10 years, ticks are everywhere. But when do we have to be more concerned about them, how can be identify them, and how best to remove them are questions that any of us might have. In this blog article, we try to address some of these topics. When are ticks at their peak? As with most bugs, ticks have a life cycle that is seasonal. It is the small nymphs that are feeding heavily in the spring and summer (May through July) and that do the most damage in transmitting Lyme disease to their hosts. Other stages of ticks are not as likely to transmit pathogens and in the winter time, they become very inactive, especially when the ground is frozen. How do you identify a tick? There are many bugs that will look like a tick and are concerning to may of us, especially at this time of the year. Each of the major news stations have had alerts about the billbug, which will be very prevalent for the next couple of weeks still because it is their mating season. However, ticks are different than most other bugs we will find in our yards and in our homes, because ticks have 4 pairs of legs. Most insects will only have 3 pairs of legs and then a set of antennae on their heads. Ticks will vary in size depending on the time of the year, but the baby nymph ticks that aggressively search for a host start out as the size of a pinhead. They will slowly grown in size as they feed and move from one host to the next. Ticks are not typically seen in swarms or groups. They do not fly or jump, and only crawl. Most often, they attach themselves to a host by waiting in an areas that are likely to be contacted by a passer-by and they transfer when you make contact with them. Below we have supplied some pictures of ticks and insects that are often confused with ticks. How do you remove a tick? If a tick attached themselves to your skin, you will want to remove them with pointy tweezers. These can often be found at a drug store if you do not have them already. Grab the tick as close to your skin as possible and pull straight back. If you are not able to get the head out of the skin, it will eventually fall out, so no need to worry there. 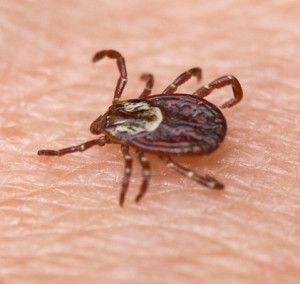 In order for a tick to start transferring the pathogens that cause Lyme disease the tick will generally have to be on your skin for over 24 hours, so timely removal will prevent disease transfer. Here is a link to the local KDKA news report on billbugs in our yards.